I normally stick to art and craft posts on this blog because that is the stuff I like best. Imaginary play and I don't really get along. I do my bit and pretend to be a lion or whatever is demanded but I know I am lacking in the enthusiasm department. Since being away from home, Cakey and I have been doing a lot less craft than normal. Our craft supplies from home have all been used up and we are not set up for anything too messy. This has meant I have been forced to participate in loads of imaginary play. Our coconut tea party has been my favourite to date. We are fortunate to have rented a holiday house with a coconut tree. This tree has heaps of coconuts on it and heaps on the ground too. 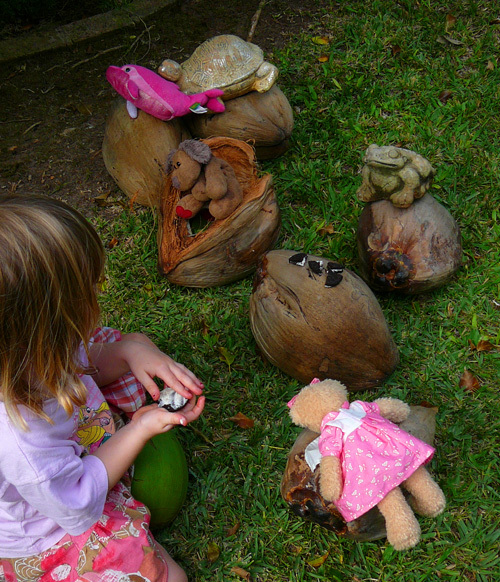 The coconuts are just perfect for rolling into a circle and setting up a tea party for all of Cakey's animals. For Cakey, I think the best bit is when we cut up some oreos for all her animals to share... she always kindly helps them polish them off. 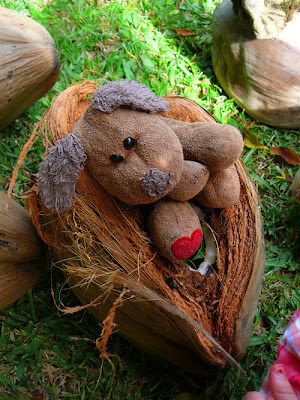 That is the first coconut tea party I've ever heard of - such a great imagination and fun. What a neat idea to use the giant leaves as plates! So cute! Yeah the giant leaves were great, I have no idea what they were but it was a fabulous tree. 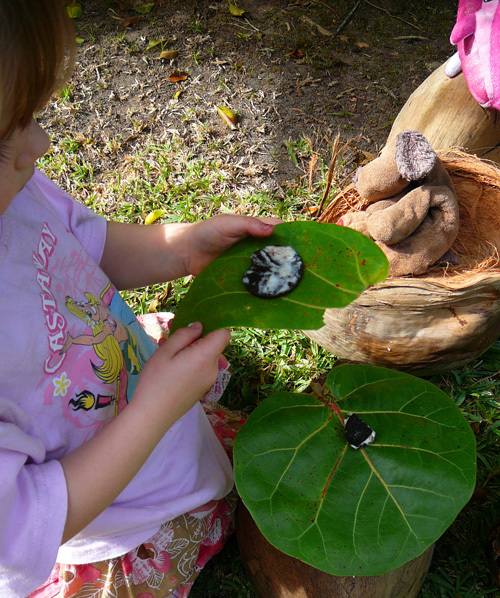 It seems like the materials the the girls' imaginations were enough to have a wonderful afternoon! Thanks for sharing - I'm glad to have found your blog. I remember this post! Congrats on the Top 9!